“I looooove stonefruit!” my four and a half-year old son exclaimed in his emphatic and low, but very loud exuberant voice. My mother-in-law took my kids grocery shopping and he chose some apricots. I could not actually believe it when I saw that they were from California (maybe some part that is actually Mexico, and in a greenhouse?). 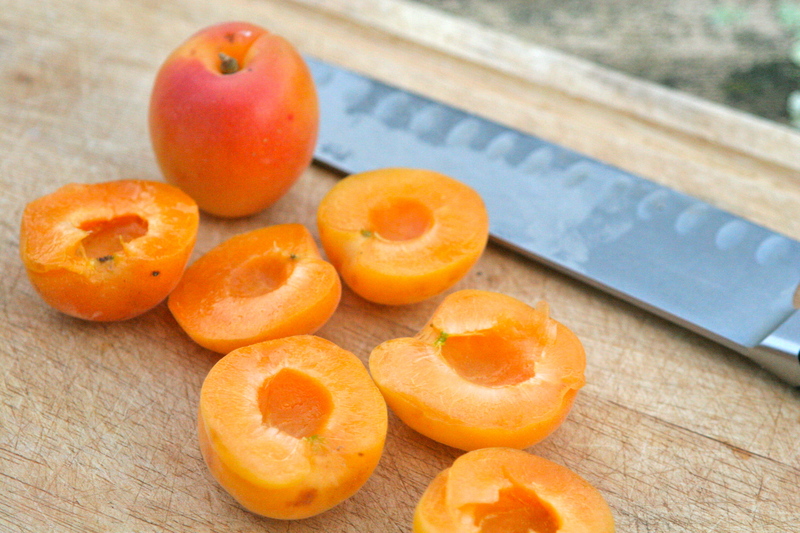 Are we really at cherries and apricots season? Apparently, the answer is yes. On my way to sister #4’s graduation last weekend I simply had to stock up on a bar or two of amazing chocolate from Bi-Rite Grocery and in the process came across a basket of shiny, plump, bright red cherries. We ate them in the car ride to the San Joaquin valley and my son graciously saved about four of them to save with six other people. I should probably warn those of you who have been reading regularly that the next few months will include preserves madness (I made eleven different types of preserves last summer and I have already prepared for this summer with new Weck jars) and lots and lots of fruit desserts and baked goods. In a short few weeks we will be in full swing for cherries and apricots and by full swing I mean my small family putting down a flat of cherries or apricots in three or four days…this equals about 15 pounds of stone fruit. My kids have no plumbing issues over here. We are away on a trip for a little while and so I was trying to make meals using what I had on hand. 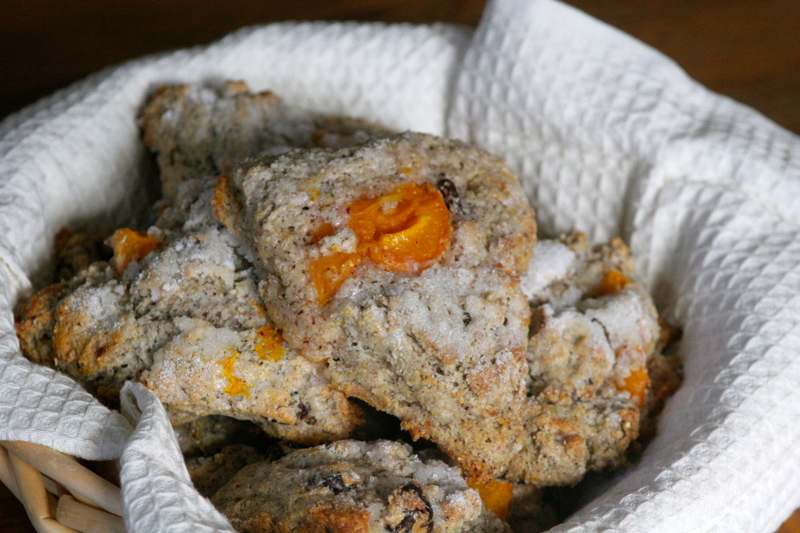 These scones are the happy marriage of my favorite stone-ground multi-colored cornmeal, fresh apricots, and dried cherries. As with my cornmeal-pinenut cookie, you want to let the scone dough rest for a couple of minutes before forming and cutting the scones so that the cornmeal can absorb a little bit of the moisture. Bings. Ah, I cannot wait either. Preheat oven to 425F degrees. Line 1 or 2 baking sheets with parchment paper or a baking mat. 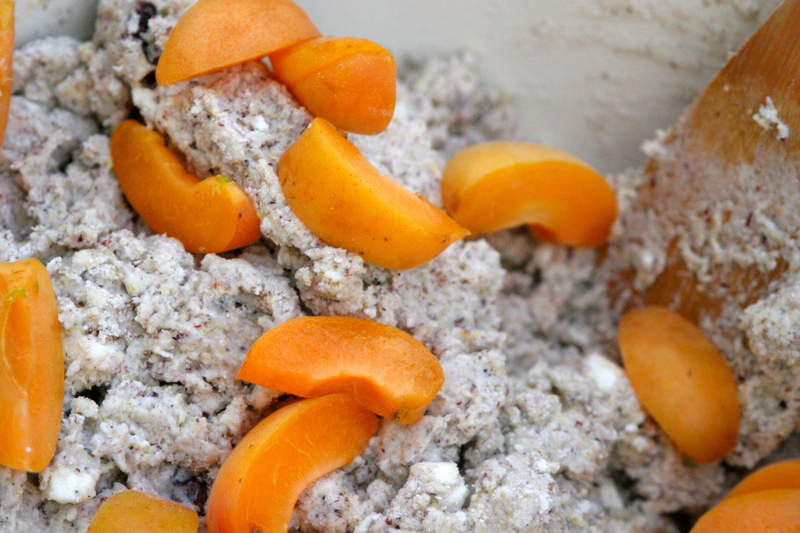 Sift together flour, baking soda and baking powder into a large bowl. Add salt, 2/3 cup sugar, and the cornmeal. 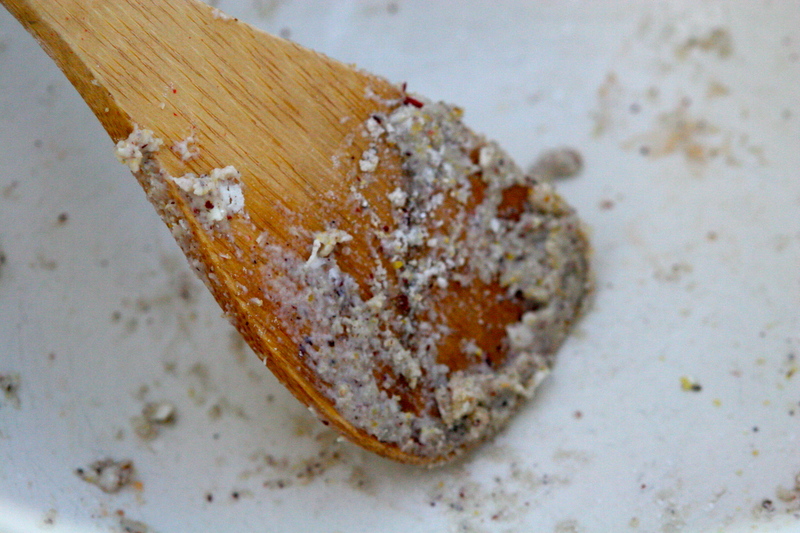 Stir with a wooden spoon until combined. Add butter and cut in with a pastry cutter until it is the size of small peas. Using the spoon, mix in cherries. Add the soured milk or buttermilk. 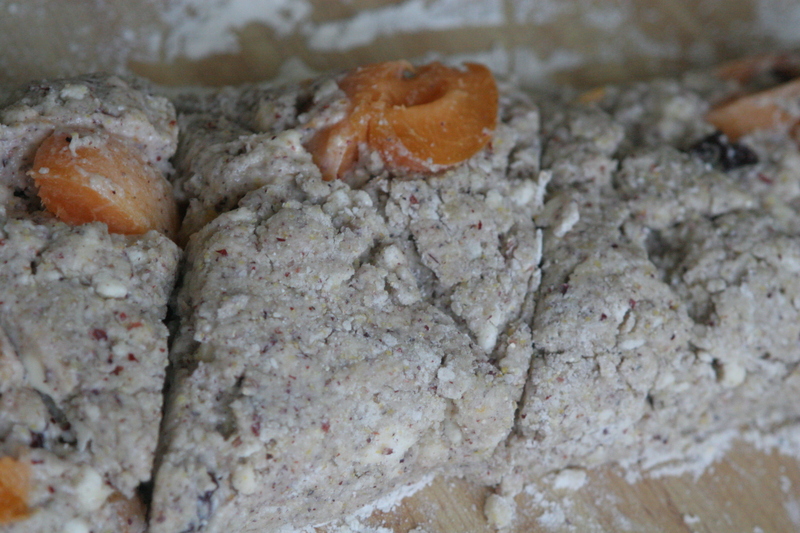 Mix briefly, until ingredients just come together and lightly fold in the sliced apricots; some loose flour should remain at bottom of bowl. Let the batter rest for 5 minutes. Gently pat the dough into a long log. Cut small triangles out of the log. You should have about 12-15. Or make a large circle and cut triangles as a wheel. Or make small rounds for each scone. Sprinkle the 1/4 cup sugar on top of the scones. Place the scones on the middle rack of the oven and immediately turn the temperature down to 375°. Bake 20-25 minutes, or until the scones are golden. Do not underbake because the crunchy, cookie-like edges are heavenly. Transfer the scones to a wire rack to cool. I love stone fruit too! These look so rustic and delicious. I can’t wait for summer full of preserves!